Since 1877, American Humane has celebrated the human-animal bond, which is a vital cornerstone for humane communities. As the nation’s oldest humane organization, our unique dual mission is to improve the welfare, wellness and wellbeing of both children and animals. We recognize that in order to understand the world of people, pets, and the inextricable link we share, more research on the power of the bond still needs to be done. 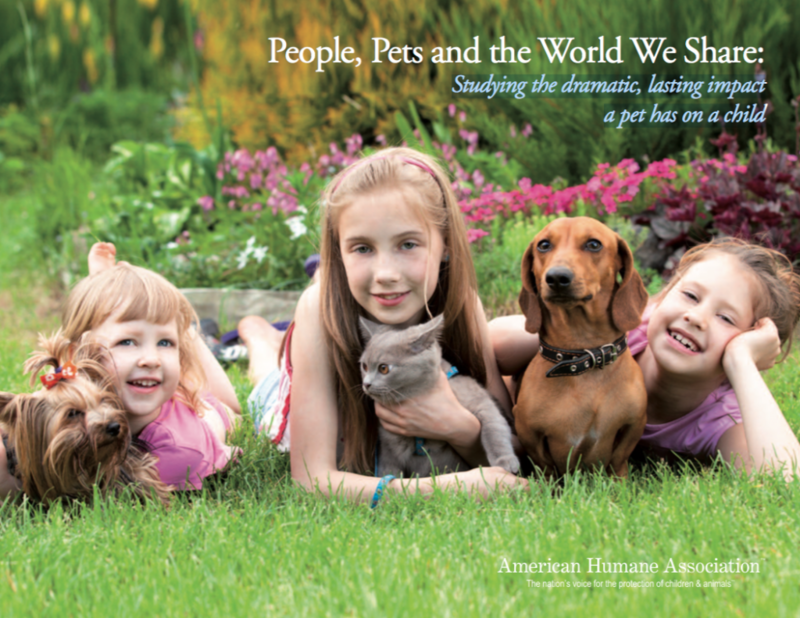 American Humane is pleased to share the results of this survey initiative as an important step for future work to assess the importance of pets to children. In March 2012, a survey was conducted that speaks to the remarkable bond and loyalty between children and their pets. The survey gathered information from adults on the effect of losing a pet during childhood. An email survey was sent on behalf of American Humane’s Animal Welfare Research Institute to its members and Facebook fans, and was open for one week with 294 people responding. Of those respondents providing information on their gender, 93.2 percent were women (272 of 292). With regards to age, 12 percent were under the age of 30 years, 44.8 percent were between the ages of 30 – 49 years, and 43.2 percent were over the age of 50 years. Of respondents who answered questions with a specific pet in mind, 71.8 percent selected a dog and 23.8 percent selected a cat. The remaining respondents answered for a myriad of other animal types: horses, rabbits, hamsters, goats, or birds. Of those responding who lost a childhood pet from injury, disease, or old age, 38.9 percent (105 of 270) reported that the loss still affects them. Similarly, of those responding whose pet was given away, ran away, or had uncertain disposition, 44.4 percent (36 of 81) reported that the loss still affects them. Although many adults in this survey reported to still be affected by the loss of a childhood pet, support for aiding the child-pet relationship in families is often lacking. American Humane hopes that this survey will guide future efforts in creating healthier and happier families and communities.